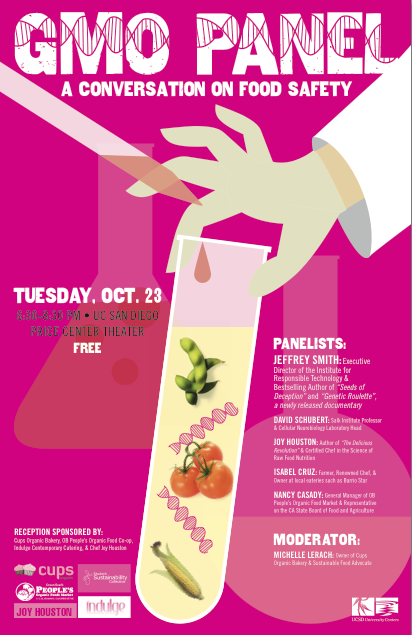 You are invited to a conversation on food safety tomorrow, October 23rd at The Price Center Auditorium at UCSD from 6:30pm to 8:30pm. and delicious GMO-free drinks and snacks. Jeffery Smith: the Executive Director of the Institute for Responsible Technology & best selling author of “Seeds of Deception” and “Genetic Roulette”, a newly released documentary. It will be a pleasure to see you in person if you are a local here in San Diego. If not I invite you to show your support for labeling GMOs in the comments below or on our FaceBook page. I think such kind of program is more needed for keep safe our health. So i think it should be help us to get more idea how we can get more safe food in the world. Excellent health care education you give of us and i mean every one need to obey the tips from you. To keep up fit and healthy such kind of information is more essential for us.